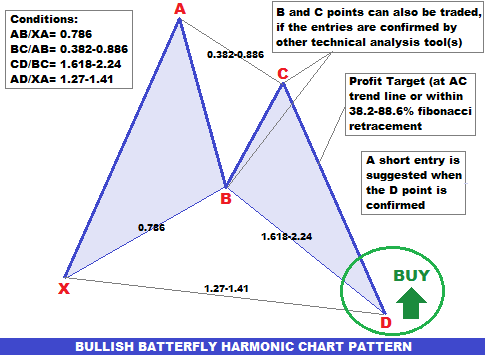 How to find or draw a bullish butterfly harmonic chart pattern on price chart? To draw a bullish butterfly harmonic chart pattern, first of all, we are to find the X and A points of the pattern. Then we have to find the B point of the pattern. To find the B point of the pattern, we have to draw a fibonacci retracement tool from X to A. 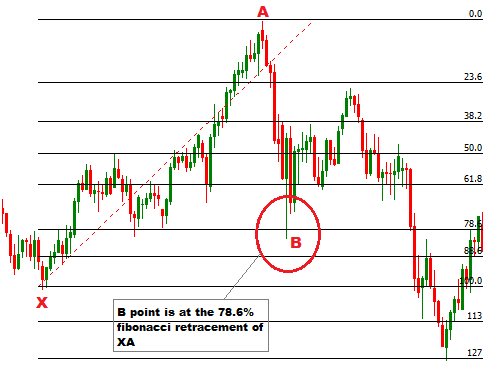 The B point should be at the 78.6% fibonacci retracement of XA. The B point of this pattern should lie on the price levels found from formula (IB). This satisfies the AB/XA=0.786 condition of the pattern. Look at the following illustration. Next, we will draw a fibonacci retrcement tool from A to B to find the C point of the pattern. 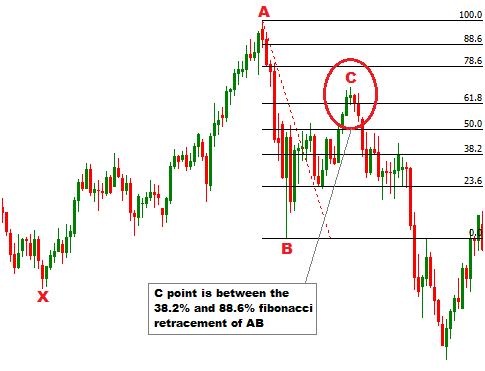 C point should be between the 38.2% and 88.6% fibonacci retracement of AB. 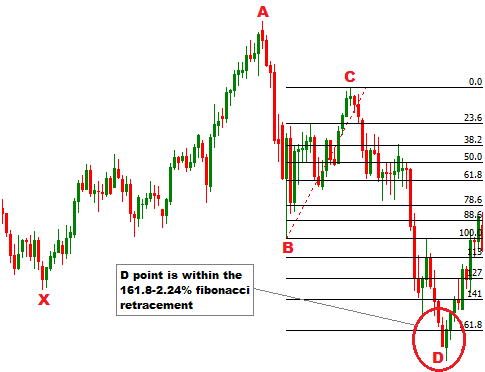 In the next step, we will draw a fibonacci retracement tool from B to C to confirm the D point of the pattern. The D point should be between the 161.8% and 224% fibonacci retracement of BC. The D point of this pattern should lie between the price levels found from formula (IB) and (IIB). This satisfies the CD/BC=1.618-2.24 condition of the pattern. Look at the following illustration. We know that D point is the entry point of the pattern, that is why, D point is reconfirmed. To reconfirm the D point of the pattern, we will draw a fibonacci retracement from X to A. 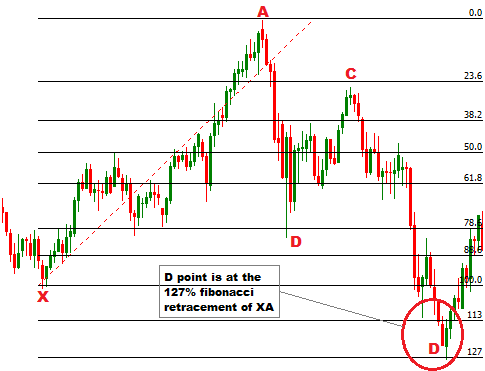 D point should be between the 127% and 141% fibonacci retracement of XA. In this case we can see, accurately satisfied the AD/XA= 1.27-1.41 condition of the pattern. See the illustration below. Remember, the D point is the entry point of the pattern, and it is confirmed by two conditions. A reliable D point should satisfy the both conditions, but it is also accepted, if the one condition is satisfied. How to trade bearish butterfly harmonic chart pattern? A short entry is suggested when the D point of the pattern in confirmed. The stop loss for the order should be placed at the upper resistance level. The take profit for the order should be placed at the 38.2-88.6% fibonacci retracement of CD, depending on the fundamental analysis. B and C points can also be traded, if the entries are confirmed by other technical analysis tool(s). It will not be more easy if we use zigzag indicators together to find the butterfly harmonic? I don't think zigzag indicator is a tool to draw a harmonic chart pattern.